One of the places listed as a hot spot for birding in Florida was the Evergreen Cemetery. There were some nice trees and a lagoon or canal that ran along the back end, which is where we took a few of the bird photos. 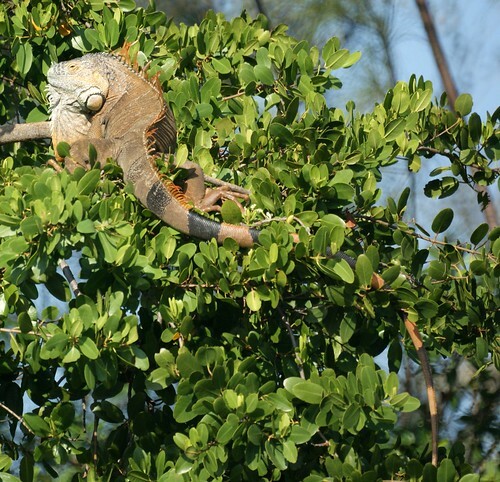 After being there for a while, Chris noticed a VERY LARGE iguana in a tree near a small heron. We worried for a while that it was planning a meal, but there was no need for us to worry as we remembered they're vegetarians. So, as we made our way around to the other side of the water for better lighting conditions for pictures for Mike, Chris was loathe to discover there were A LOT of her least favorite creatures, the iguanas, in the trees. They all seemed to be sunning themselves in the trees, which is fine, but as Mike pointed out, Chris would never rest in peace if buried in this cemetery.